Stony Plain, Alta. — Phil Bakker’s potatoes are taking local to a whole new level. He’s not only feeding urbanites; he’s teaching them how to grow, too. “It’s been a good name because it helps us differentiate in a highly commoditized industry,” said Bakker, director of sales and marketing with the company based in Stony Plain, Alta. But these potatoes, which come in 10 different varieties, aren’t the kind normally found in the grocery aisle. They’re small, flavourful and some are colourful. The product comes at a time when consumers are demanding more local goods, especially ones they can grow in pots or in their backyards. But what helps Earth Apples stand out, Bakker said, is how it connects producers with consumers because urban dwellers are taught how to grow them. Bakker’s parents’ company, Solanum International, opened the doors to launch Earth Apples. 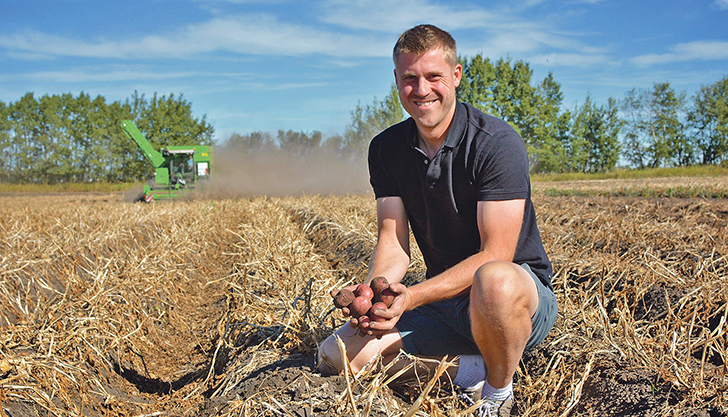 Solanum works with seed potato farmers in the Stony Plain and Spruce Grove region, offering 40 to 50 varieties. Earth Apples uses 10 of Solanum’s varieties. It sells seed potatoes that look and taste unique, as well as ones that are generally easier to grow. They are sold in one kilogram boxes and each box contains directions so consumers know how to grow them. He said the potatoes are harvested around late summer and then stored until February, when they are retrieved for processing. When it’s time to bag, Bakker uses a machine with a conveyor belt to help sort and weigh the potatoes. He said business is growing at a steady pace. But expansion is happening at a more moderate pace. He is looking to expand in California and make his way into Ontario. Last season, Earth Apples were sold to consumers in Western Canada.